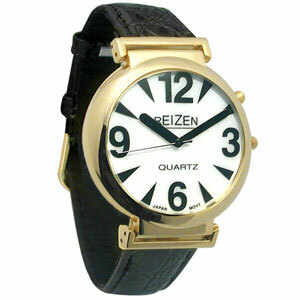 REIZEN Watches with White Face and Illuminated Face Dial - Leather Band. WITH LEATHER BAND. These high quality Quartz Movement Watches feature a extra wide dial that’s 13/4” in diameter for easy viewing, extra large thick hands, large numbers, gold finish and 1 Year Warranty.